Dread encountering a flat tyre in the middle of heavy traffic? We are on your side even before that can happen. 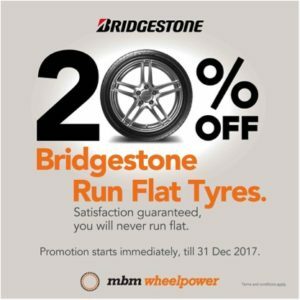 We are giving you a 20% discount OFF our BRIDGESTONE Run Flat Tyres now. What are you waiting for? Come on down to our service centre and take advantage of this limited time offer NOW so you won’t be running flat and running up your maintenance cost in a flat tyre emergency.